Melt 2 tablespoons butter in a small dish. Pour the potato flakes into another shallow dish. Give the flakes a light sprinkle of salt and pepper. Dip each shrimp into the butter, and then transfer them to the potato flakes, coating on both sides. Continue until all the shrimp are evenly coated. Heat the remaining 2 tablespoons butter in a large skillet. Working in batches, arrange the shrimp in a single layer in the pan; sear on one side for 2 minutes. Flip and sear 1 more minute or until both sides are golden brown. In the meantime, place the mayo, chipotle peppers, adobo sauce and cilantro in a small food processor. Pulse to combine until smooth. 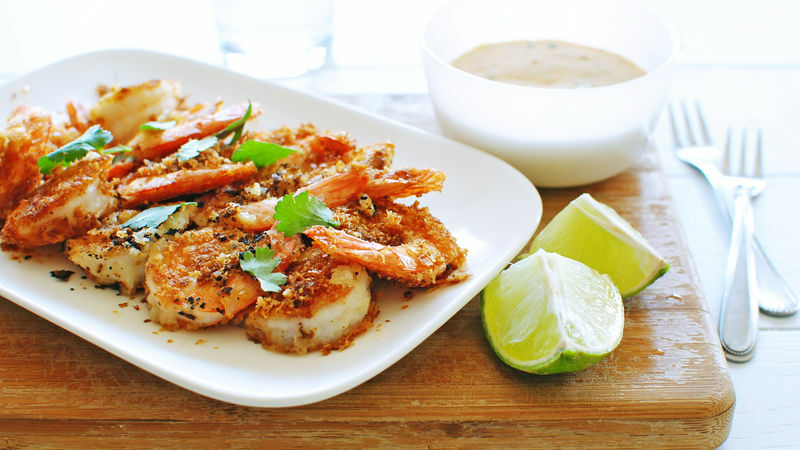 Garnish shrimp with cilantro leaves and serve with the lime wedges and the chipotle dipping sauce. Let's see. Shrimp coated in butter and potatoes. I'm thinking duh. There are appetizers. And then there are APPETIZAAAHERRRRSAAA. There are snacks. And then then are SNAAAHAAAACKSAAA. This here Potato-Crusted Shrimp business with Chipotle Dipping Sauce situation clearly falls into the latter. a) Your face is going to melt off with happiness. b) Your guests' faces are going to slide off with glee. c) You won't stop at just 25.
d) Your guests won't stop at just 39.
e) You'll wish your mouthal cavity was forever lined with it. d) Your guests will wish their soul cavities were forever filled with it. But honestly, there's not much to say about it. Let's make it, good grief! Grab a pound of shrimp (I only made a 1/2 pound for myself, since I was alone. But you. You make a full pound. Yesh. ), some buttah, Betty Crocker Potato buds (instant potato flakes), mayo, chipotle peppers in their adobo sauce, and some cilawwwwntrow. Now you can make the sauce early, or last thing. But you'll just toss the mayo, peppers, adobo sauce and the cilantro into a small food processor. Blitzerooo. Now, melt half the butter in a small dish, and place the flakes and a pinch of salt and pepper in another shallow dish. Dip each shrimp into the butter, and then into the flakes. Then you'll melt the remaining butter in a skillet and sear the shrimpies until golden brown, mmmmm. I didn't get to snap a photo because my husband was out of town and he called right then and then my hair blew up. I look at this and wonder how on Earth I only made a 1/2 pound for myself. What was I even thinking? And oh man, squirt some fresh lime over the whole plate and dip it in that sauce let me taaaaaayell yew. I'm making 17 pounds next time. Bev's totally kidding! 20 pounds. For more musings, visit her blog Bev Cooks and her Tablespoon profile.